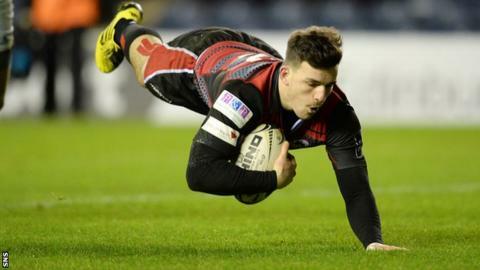 Edinburgh put in a dominant performance to secure a bonus-point win over an ill-disciplined Newport Gwent Dragons in the Pro12 at Murrayfield. WP Nel's try set the home side on their way with fellow prop Alasdair Dickinson, Tom Brown and Matt Scott crossing in the second half. Poor discipline and a leaky defence proved the visitors' downfall, with a remarkable four players yellow-carded. Nic Cudd scored a late consolation try, but Dragons remain without an away win. They stay ninth in the Pro12 table, while Edinburgh move up a place to sixth. The Welsh side showed three changes from the side that had lost narrowly to Castres in Europe but they were once again without the injured Taulupe Faletau. Edinburgh went into the game after back-to-back wins in the European Rugby Challenge Cup but having lost their previous three games in the Pro12. Sam Hidalgo-Clyne slotted a penalty to secure the home side's first points but Dorian Jones soon levelled for the Dragons. Edinburgh restored their lead with impressive tight-head Nel burrowing through the Dragons defence from close range. Hidalgo-Clyne successfully converted before adding a further penalty as the home side monopolised territory and possession. Dragons kept in touch with fly-half Jones cutting Edinburgh's advantage to seven points with his second penalty. The visitors were fortunate to trail only by that margin at the break - Tom Brown spilled a Phil Burleigh cross-kick, and Nel was denied a second try after television match official Jim Yuille adjudged the Scotland prop guilty of a double-movement. Edinburgh started the second half in the same vein, enjoying typical supremacy in the scrummage - Nel saw two looseheads, Boris Stankovich and Phil Price, yellow-carded after too many infringements, resulting in uncontested scrums. Despite being down to 13 men, Dragons withstood home pressure but their defensive resistance was broken by Dickinson as Edinburgh showed a somewhat novel offloading abandon and verve in the wider channels. Hidalgo-Clyne added the conversion and Dragons were dealt a further blow when fly-half Jones was yellow-carded for a dangerous tackle in the build-up to the try. Stankovich returned to the action with his side still under pressure and as Jones returned to the field, Cudd became the fourth player to be sin-binned. The 14 men defended doggedly but Edinburgh scored a third try when Brown drove over from close range, although Hidalgo-Clyne failed to convert. The game opened up during the final five minutes and although Will Helu was bundled into touch just short of the line, Edinburgh's fourth try of the game secured a bonus point. Scott's try was converted by replacement Blair Kinghorn but Dragons had the final word with Cudd crossing, converted by Jones. Edinburgh: Greig Tonks; Tom Brown, Chris Dean, Matt Scott, Will Helu; Phil Burleigh, Sam Hidalgo-Clyne; Alasdair Dickinson, Ross Ford, WP Nel, Alex Toolis, Fraser McKenzie, Mike Coman (capt), John Hardie, Cornell Du Preez. Replacements: Neil Cochrane, Rory Sutherland, John Andress, Jamie Ritchie, Hamish Watson, Sean Kennedy, Mike Allen, Blair Kinghorn. Newport Gwent Dragons: Carl Meyer;Tom Prydie, Adam Hughes, Adam Warren, Ashton Hewitt; Dorian Jones, Charlie Davies; Boris Stankovich, Elliot Dee, Shaun Knight, Matthew Screech, Rynard Landman (capt), Nick Crosswell, Ollie Griffiths, Ed Jackson. Replacements: Thomas Rhys Thomas, Phil Price, Lloyd Fairbrother, Cory Hill, Nic Cudd, Sarel Pretorius, Jason Tovey, Ross Wardle.